I'll keep the historical background brief. Needless to say, the Hawk has been the most successful trainer that Britain has had since World War II. In fact, it rivals the Hunter as to it's popularity overseas. Despite a general post-war history of producing aircraft that did not do well on the foreign market, the Hawk has been an aircraft that has done very well. A very adaptable airframe that can perform both training and light strike missions with equal ease, the Hawk is suitable for those air arms who can handle some sophistication in terms of maintenance as well as those other more established countries that are looking for a capable and efficient trainer/strike aircraft. After at least 25 years in production, the Hawk is still coming off the lines. This is a new mold kit and not the older and much more short run-like Premiere kit. It has also been done as the more modern Hawk with the extended nose. If you have built Airfix's more recent 1/48 kits like the Spitfire 46/47 or their Jaguar, then this one is quite similar in overall feel. The detailing is good, but not as 'crisp' as one would expect from Tamiya or Hasegawa. It also doesn't cost as much as one would be paying from those Japanese companies. You get a pretty complete cockpit which includes pilot figures, a pair of reasonably well done bang seats and instrument panels, the last of which has raised detail on it. No rudder pedals for those who may be wondering. The canopy bits include the blast shield for the rear occupant. There is no canopy hinge bits though one could display the canopy open if one wished. The flaps can be separated from the wing and displayed lowered along with the speed brake. All of the flap hinges are separate and an alternate set is provided for the lowered flap option. For things under wings a set of Sidewinders is provided as well as a centerline gun pod. Those doing the Red A rrows version have the smoke canister, though there is no additional piping for above the exhaust. A pair of drop tanks are also supplied. 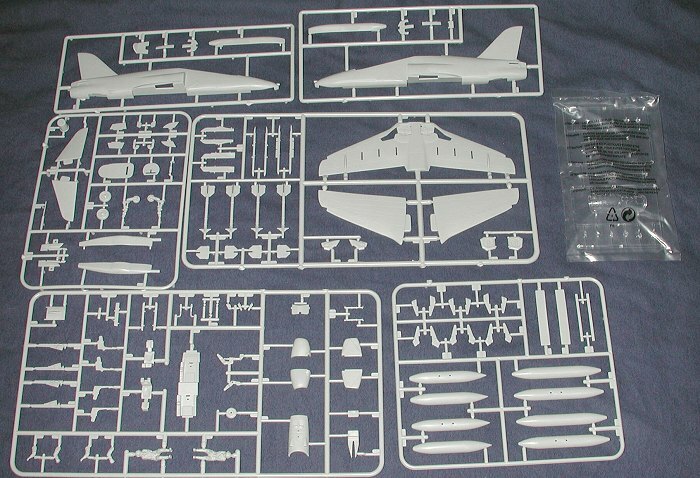 Instructions are typical Airfix and done totally pictorially. Paint references are only by Humbrol number so one is up a creek if a translation sheet is not available as Humbrol paints are not available in all parts of the world. Markings are given for two aircraft. 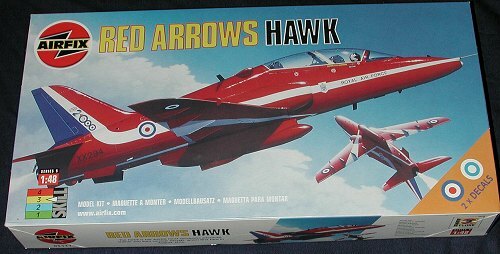 One is the Red Arrows Hawk from the 2000 season and there are enough serials provided to do any of the team planes from that season. 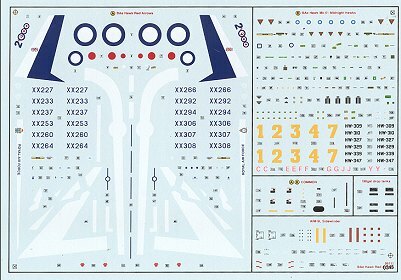 The white and blue portions of the markings are given as decals and one must apply the lower ones with the gear doors closed to get them to fit properly. I doubt if the white is opaque enough to combat the intensity of the red paint. The other is for a Finnish Hawk in the more current low viz scheme and this is from the Finnish Aerobatic team, the Midnight Hawks. A full stencil suite is also given on the sheet. Generally Airfix decals are fairly good. Mine has the yellows slightly off register. Overall, this is a kit that many have awaited. The Premiere kit is a real bear to build and this new Airfix kit is a quantum leap in quality over than previous version. I'm sure it will do quite well with Hawk fans. Review kit courtesy of me!